Let Us In On These Amazing Secrets! Finally! The First Practical, Step-by-Step Roadmap For Softball Hitting Success Designed Specifically For Coaches! These almost criminally-clever tricks, tips and secrets of the pros will IMMEDIATELY improve your team’s bat speed, power, and confidence at the plate, no matter how much you're struggling right now, or how little coaching experience you have. My name is Coach Becky Wittenburg. I'm not a professional “writer”… just a regular gal with a husband, 2 kids, and a lifelong passion for the game of softball. But what I'm about to share with you today is so extraordinary and powerful, I decided to forget what the all the experts say -- and just write to you myself. So please, excuse my unprofessional little website... and bear with me for a minute while I explain. If there was a guy claiming to possess "underground secrets" in some God-forsaken corner of the country, I hunted him down. A book published in 1972 on the science of hitting... I read it cover to cover. Magazine articles written by former major leaguers... I devoured them. If there was a rumor of a secret anywhere, I found it. After weeks of intense research... I had exactly 241 drills that all claimed to be the "Holy Grail" of hitting. I hired a team of professional hitting instructors and tested all the drills out. Tossed the ones that were sheer nonsense. Tossed the ones that required extra strength, or lots of experience, or any kind of extraordinary skill. Tossed everything that wasn't straightforward and easy to teach to youth softball players. In the end, we had 18 stunningly effective hitting drills. The Envy Of Every Coach In Your League! I had one of my top instructors put together a 45 minute video, explaining each one of these drills in Plain English, with step by step demonstrations and coaching tips. 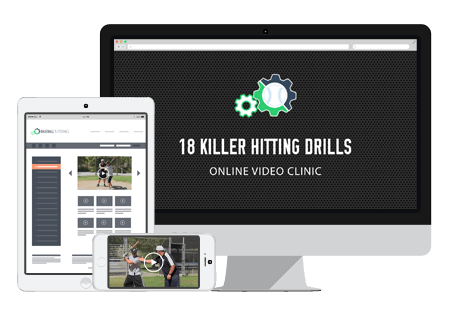 This video is designed specifically for coaches… and is guaranteed to increase your batting average, jumpstart your offensive production, and win more games for your softball team starting immediately (even if this coaching thing is all new to you). And... you can access it all today... for free if you want! “I'm shocked at how quickly these strategies started to work and how easily they translated to games. Out batting average is up across the board, and other teams around the league and taking notice." "I've been to many live clinics, but none have turned my team around quicker than this video. Your teaching methods are easy to grasp and produce results fast. That Fast Hands drill was a personal favorite and the kids had fun performing it." "The players really enjoy using these drills in practice, and they’re a blast to teach. The explanation is simple and techniques are easy to grasp." Let me boil this down further. It doesn’t matter if your players are inexperienced, skinny, or uncoordinated. That’s right. Just complete your order on our secure server (safer than ordering a meal at your favorite restaurant)… and you’ll be immediately directed to your special online clinic download page. There – you can watch the video clinic right over your computer screen. No special equipment or technical knowledge is required. Just follow the simple instructions and the video automatically starts playing. Click here to place your secure order now! And you don’t’ even have to say "yes" today… just say “maybe” - because if you're not totally satisfied with this online clinic, I'll PAY for it out of my own pocket! Okay... so how much will this package cost you (if you decide it's worth paying for)? Well... if you wanted to learn all of these techniques from a professional hitting instructor, it would probably take 3 or 4 hours to teach them. Most instructors charge AT LEAST $75/hr… bringing your investment to $225.00 or more. But since you’re a valued “e-hotlist” customer, and I want to treat you right, you can get the complete coaching system for just $225.00 $19.00 (less than the cost of a couple hours at the batting cage for pete's sake). So place your secure order right now. Today, while you are still reading this letter. Just imagine yourself on the bench at your next game… watching player after player crank gorgeous line drives to every corner of the park… and smiling so hard your cheeks hurt. Simple secrets. Easy to use. Hit better, win more softball games, and finally get the respect you deserve as a coach. You gotta jump on this, or lose out. P.S. Remember... you have a 100% money back guarantee. That’s as generous an offer as you’ll ever find. The only thing you have to lose is a few moments of your time.